I am so excited that we didn’t miss Halloween. With Sandy coming through we had no idea what to expect. We were extremely fortunate to only lose power for a day and the rain actually held off for trick or treating. Riley was so excited about trick or treating that she even came home from daycare singing “Trick or treat. Smell my feet. 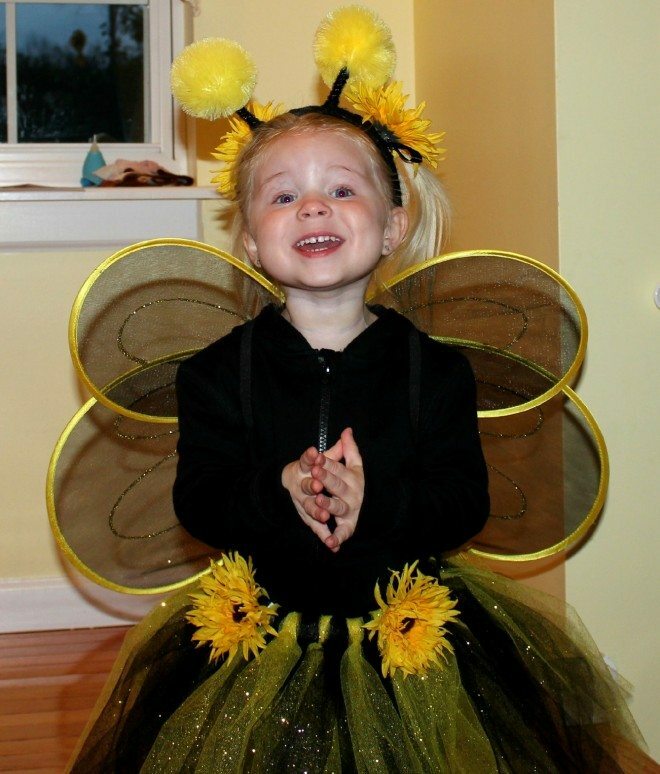 Give something sweet to eat.” I have her BF, Ella, who is also two, to thank for that one. Thank goodness Riley held off on singing this at the doors. 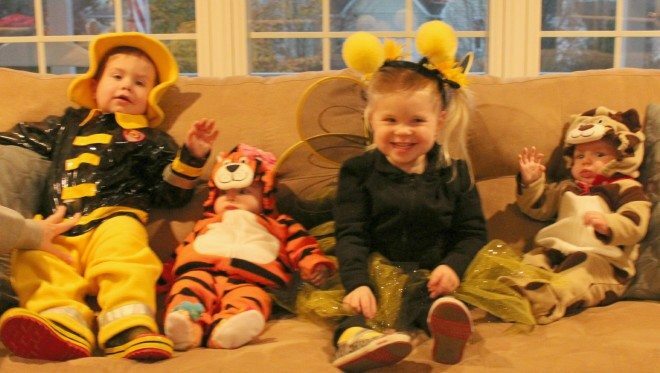 We even got to go trick or treating with all of her cousins because my brother couldn’t get into the city for work. My nephew, Aidan was a fireman. Kylie was a tiger and Connor was a puppy dog. Can you tell that Riley had trick or treating held over her head during pictures? You do what you have to, right? 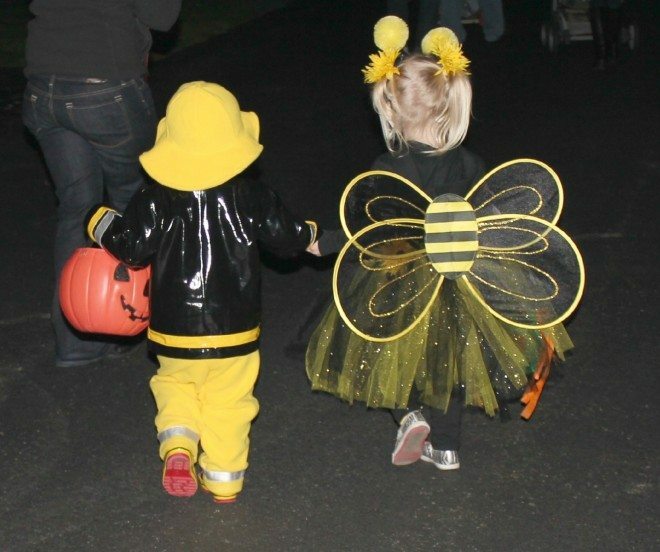 Riley and Aidan are nine months apart and they were so sweet holding hands walking from house to house. The black and yellow only happened to be a coincidence, but made the pictures so cute. 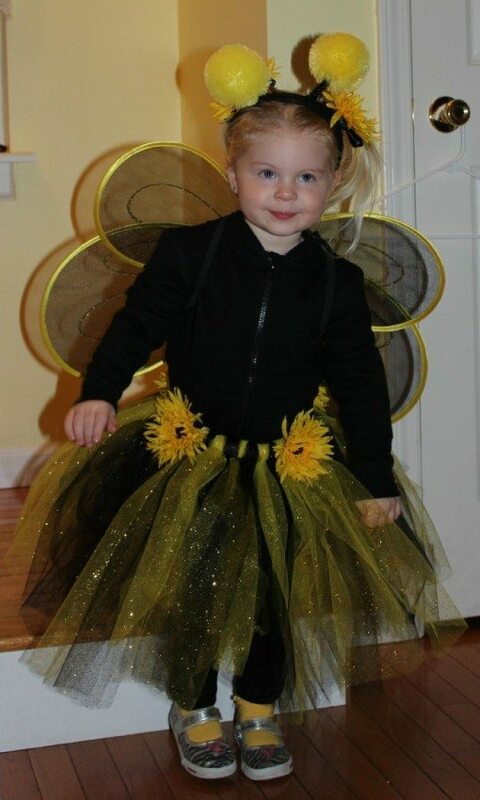 I made Riley’s Bumble Bee Tutu using my Infant Tutu Tutorial. My biggest mistake was using tulle with glitter, which ended up all over my sister’s house. I’m pretty sure my sister wanted to kill me. Oh dear, glitter… 🙂 That would get everywhere, but it’s totally worth it cuz she’s super adorable! Stopping by from Two Sasters! I’m soo excited you guys were able to go out for Halloween, so were we!